Hastings Priory batsman Harry Finch has signed a new two-year contract with Sussex County Cricket Club. The deal will see Finch remain at The 1st Central County Ground, Hove until at least the end of the 2018 season. Twenty-one-year-old Finch, who was born in Hastings, began his Sussex career at the age of 13, and progressed through the Sussex age group and academy system. He made his first-class and list A debuts in 2013 before making his first NatWest T20 Blast appearances a year later. Finch has subsequently sought to secure his place in the first-team, playing in all three formats during the 2016 campaign. He scored his maiden first-class century this season in the university match against Leeds/Bradford MCCU before hitting a fine hundred in a tour match against a strong Pakistan attack. Finch’s season, however, came to an abrupt end after sustaining a broken thumb on the opening day of the Specsavers County Championship match against Essex at Colchester. Of his new contract, Finch said: "I’m absolutely delighted. I’m really looking forward to the next two years at the club. I can’t wait to get back out there and playing, and hopefully, winning some trophies in the next couple of years. Sussex’s head coach Mark Davis said: “Harry has shown great improvement this year and we are thrilled to have him extend his contact. 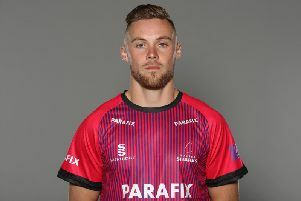 Finch didn't make a Sussex Premier League appearance for Priory this season during his increasing playing opportunities for Sussex, but did make seven appearances during their promotion-winning campaign of last summer, scoring 410 runs with a best of 126 not out.